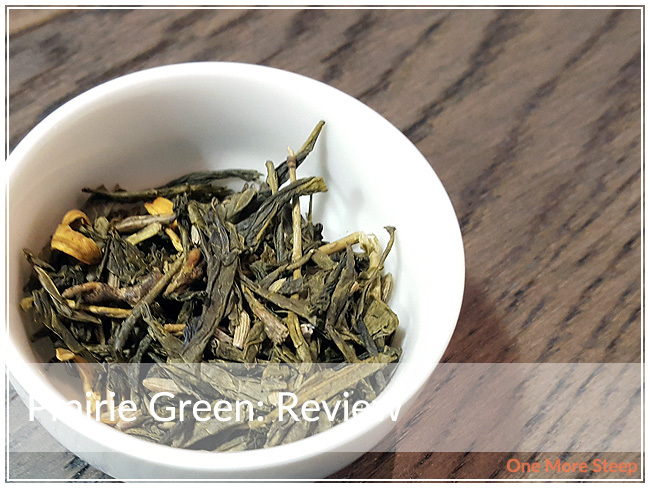 I got a trio of teas blended from Tea in Texas as a birthday gift this year, and this review is of the first one that I tried – Prairie Green. What drew me most of this tea as I was smelling the aroma from the dry leaf is the bright freshness of the orange and lavender in the blend. The citrus is fresh smelling, and the lavender has a sweet floral aroma. Prairie Green is a blend of green tea, orange peel, and lavender. All of the three ingredients are visible in the green tea blend. Tea in Texas recommends steeping Prairie Green in 180°F (82°C) water for 3-5 minutes. My initial steep of Prairie Green was for 4 minutes at 175°F (80°C). Prairie Green steeps to this beautiful yellow. The aroma that wafts up from the steeped tea as I poured from teapot to teacup was one of mostly citrus and lavender. The aroma is so inviting. The lavender is light and strong enough to be noticed over the orange peel. The citrus notes are fresh, bright. 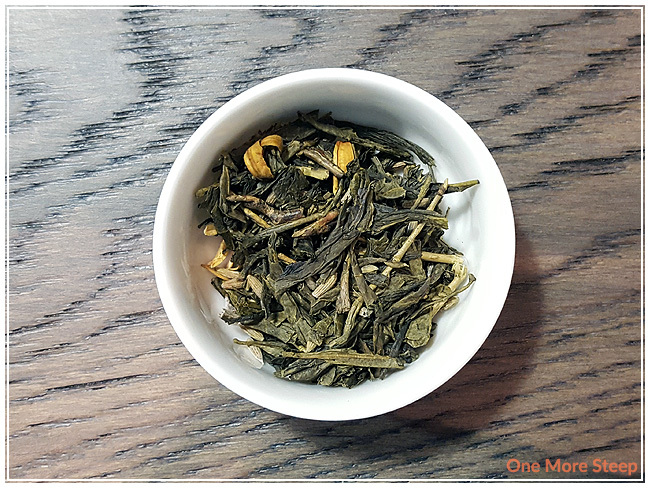 I can make out the green tea base – it has a vegetal undertone that is nice. When I sip this tea, I can taste the individual ingredients and yet they’re blended so well. 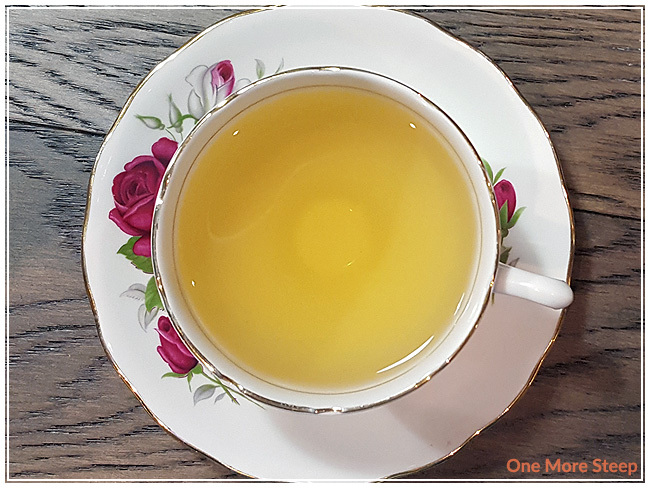 I find that there’s a great floral taste, a sweetness to the citrus, and there’s the vegetal earthiness to the green tea base that’s so inviting. The tea lacks bitterness and astringency at the temperature and length of time I initially steeped it for. I resteeped Prairie Green twice, adding an extra 30 seconds per steep. I found the first resteep to be just as bright in citrus flavours, although the lavender wasn’t as strong. 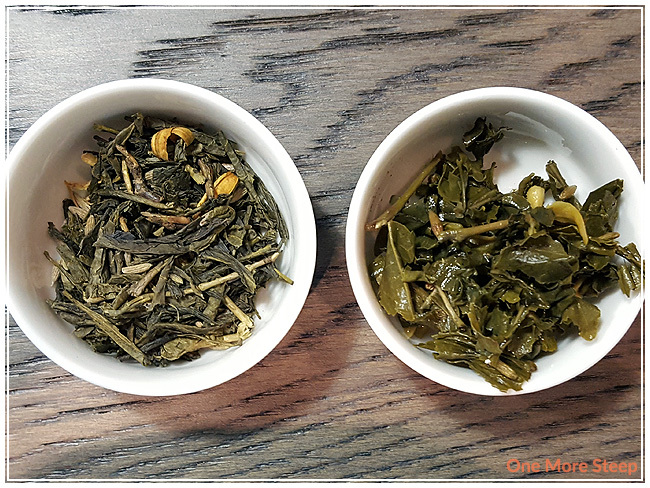 The green tea is beautiful to watch unfold, and the vegetal flavours are delicious. The second resteep is less vibrant in flavour, but still tasty. I loved Tea in Texas’ Prairie Green. 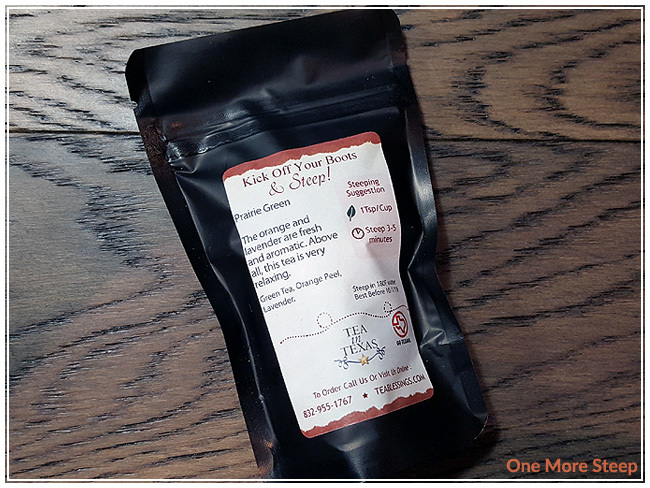 There’s just something really inviting by this blend of green tea, orange peel, and lavender. I really enjoyed the citrus notes in the dry leaf and steeped tea, while the floral notes from the lavender carried over well to the tea. I thought the tea steeped well, and would definitely recommend a second steep of the same leaves. It would go great with savouries, but I also think it would be an excellent tea iced because of the citrus flavours.